My friends and family know how much I love animals. I’ve worked with livestock in the past, shearing sheep and slaughtering both fowl and ungulates. When we started talking about the farm just under a year ago, one of the most prevalent questions was, “Will you have animals?” The answer was always, “Yes, we’d like to… but not this year.” It seemed completely unrealistic to start out with livestock our first year in Montana, first year on this land, and first year farming on our own. Yet here we are, only a few months later, and we’ve adopted two kids. 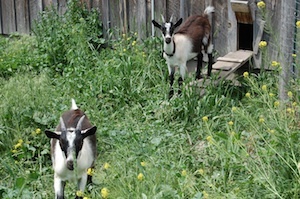 Siblings Lucinda and Leonard are 4-month-old French Alpine dairy goats from just up the road. They are incredibly sweet and personable, and are the kids of our neighbor’s best milker. They follow me around the farm, back and forth to their temporary grazing home (the chicken yard), without so much as a horn in my leg. Even the dogs are doing well with our new additions. While Margaret still works part time in Missoula, the goats add another dimension of time commitment and energy allocation. Our crops are growing almost as fast as the weeds, irrigation is constantly on the brain, and we’re barely able to keep up with market, the growers’ co-op, and (most importantly) our FarmShare members. On paper, getting goats and beginning this project is completely and totally nuts, logistically and financially. After only two days with the kids, however, I am so very pleased to have them here on the farm. This land already has so many elements of diversity and has been cared for so well over the years. Our big-picture goal is a sustainable and diverse farm: one that encompasses veggie production, diary production, meat production, and hay production. This is the very beginning of that system. Lucy and Leo will graze areas that need to be cut back, as well as veggie production land once the season has passed. They’ll munch the rest of the overgrown spinach and salad from the spring and, in early winter, the clover, melons, cucumbers, and many other crops that won’t be tilled under for cover cropping this year. Their manure will add needed nutrients to the soil, and they’ll keep weeds and some of those previously-mentioned crops from going to seed. It’s a huge project to jump into, but the truth is that we love this farm, we love our lease, and we’re not planning on going anywhere fast. Lucy and Leo are the beginning of a small herd we hope to foster and milk for production by 2013. This summer we’ll find another doe to overwinter, hopefully a kid from good milking stock with a personality to match Lucy and Leo. If our proposed budget is anywhere close to accurate, we won’t break even with the goats until 2016, and now seems as good a time as any to get the ball rolling. Our budget and my expectations for the next three or four years have changed dramatically since March. Though the farm is now in the green financially (whew! ), we don’t really have enough to take on a new project like, oh I don’t know… dairy goats. We’re lucky that we have a landlord who is also interested in creating a more diverse farm and is willing to take risks to do that. He’s fronting the funds for the goat project and we’re in charge of making it work. Lucy and Leo are symbols of stability and long-term investment. Though we had tentatively planned on staying in Dixon, they make it a reality. In the mornings, when I wake up to hungry black-and-white faces in the barn, it feels just right. The farm feels more complete, and the routine of having livestock has an ironic calming effect on my already mildly chaotic farm life. « previous article: Comment on New Farm Credit Rule by July 25th!